When it’s eleven o’clock this morning or thereabouts, I hope you’ll join me in a little something to revive ourselves. Bread, honey and, if you wish, some condensed milk will do nicely. Eating will help us with that eleven o’clockish feeling and simultaneously allow us to toast A.A. Milne on his January 18th birthday and, officially, Winnie the Pooh Day. phrasal noun: that bodily sensation, which is similar to a Funny Feeling, occurring in the Late Morning, that lets you know it is Eleven O’clock, or very close to it. This definition comes from The Pooh Dictionary by A.R. Melrose. It’s on my bookshelf alongside The World of Pooh (includes Winnie-the-Pooh and The House at Pooh Corner). The latter was a gift when I was seven; the former purchased by me as an adult. I’m confident that you have at least a nodding acquaintance with the characters of the Hundred Acre Woods. After all, Milne’s Winnie the Pooh books were immediate bestsellers when they were published in 1926 and 1928. 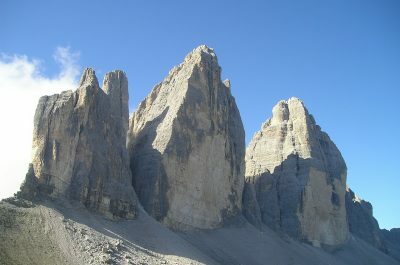 They have been translated into over fifty languages and have never been out of print. If you aren’t familiar with the books, you’ll certainly know the Disney characters. Disney purchased the rights to the characters in 1960 (and dropped the hyphens in Winnie’s name). Winnie the Pooh remains the second most popular of Disney characters, trumped only by Mickey Mouse. Writers dream of the success experienced by A.A. Milne. Wouldn’t it be marvellous to have crafted characters so distinct that even today we might refer to a grouchy person as an Eeyore, or an irrepressible spirit as Tigger. The Winnie the Pooh fame felt at least somewhat empty to Milne as well. He was never again considered a serious author for adults, despite the fact that Pooh was preceded by a very successful career that included seven novels, five nonfiction books, 34 plays and many short stories and articles. These stories of heartache and dissatisfaction sadden me. I loved Winnie the Pooh when I was young, and really wish that the author’s life had been idyllic as I’d imagined. 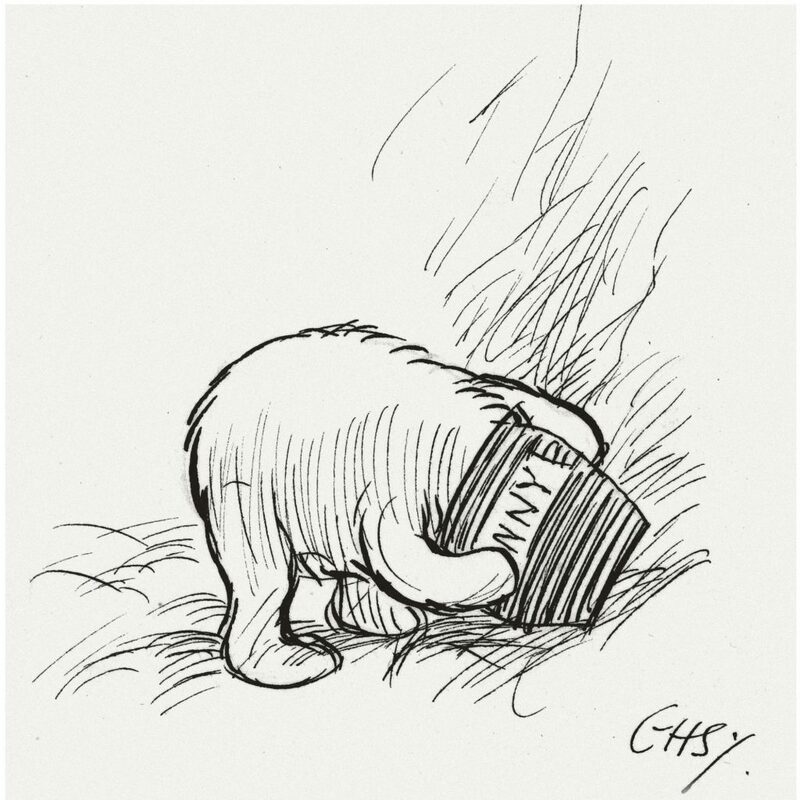 But rather than dwell on Milne’s experiences, I’m going to engage in a bit of self-care by recalling my childhood enjoyment and by honouring Milne and his friends on Winnie the Pooh Day. Tigger is my favourite character. I love his bounciness, his happy, goofy energy. However, according to this Buzzfeed quiz, my personality is more like that of Owl. True, I think, except for the part about being scatterbrained. That’s definitely not me. Then I tried the Zimbio quiz and I’m Kanga. She wasn’t even on my favourite characters list. The Playbuzz quiz tells me I’m Winnie the Pooh, probably because I opted for sweets as my preferred snack. And the Brainfall quiz, which I answer as if I were a teenager, tells me I’m Rabbit. I learn two things from this experience: 1. Quiz construction is not an exact science. And 2. Winnie the Pooh is still very popular. There are four books in the original Winnie the Pooh series. 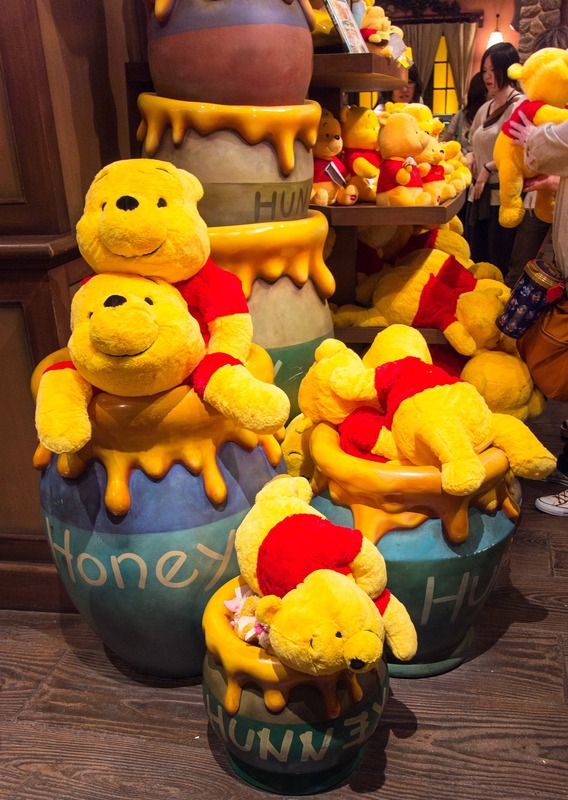 Milne began with Winnie-the-Pooh followed by The House at Pooh Corner. Those two books, as mentioned earlier, are also combined into one volume titled The World of Pooh. The other two books are volumes of poems. One volume is When We Were Very Young; the other is Now We Are Six. The two poetry collections are also combined into one volume, titled The World of Christopher Robin. I personally prefer E.H. Shepard’s illustrations, however, this short (2:30) Disney video of Pooh stuck at Rabbit’s house is a great trip down memory lane. Whether you use the following quotes as writing prompts or just think about their meaning in your life, I hope you’ll agree that Winnie the Pooh and friends had many important things to say. 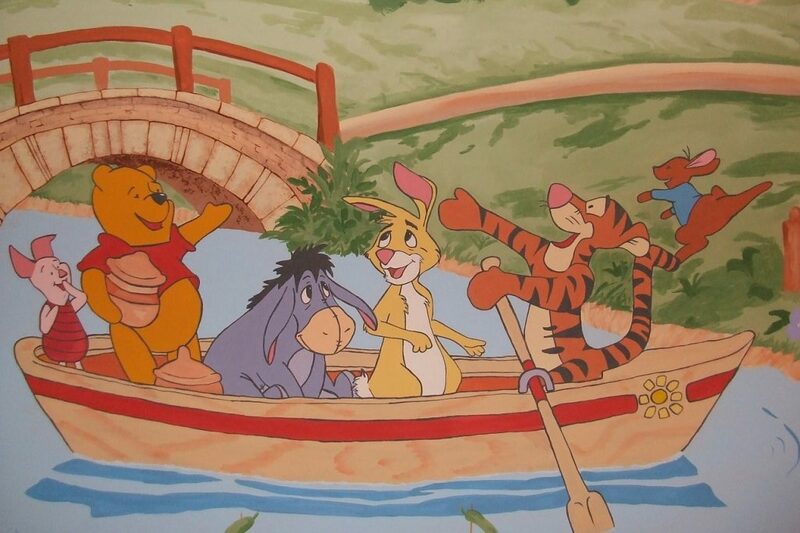 Do you have a favourite Winnie the Pooh moment or memory? A favourite character? How will you celebrate Winnie the Pooh Day? Please let us know in the comments below. Sounds like a perfect way to celebrate Winnie the Pooh Day, Natalie. I hugged a couple of stuffed toys too – an Eeyore and a Tigger. I’d love to say that they were handed down from someone but that would be a lie. I bought them four years ago at a Disney store! I love your list of quotes from Winnie the Pooh books. I had heard/read only a few of them, but so many are lovely. My favorite still is one I had heard – the one about encouragement. I only recently read Winnie the Pooh. Seriously. It was not part of my childhood, but hubby had the book in his (old) children’s book pile. I did enjoy it, maybe because I recognized its cultural significance. I find that it’s never too late to enjoy books meant for children, whether you’re enjoying them again or for the very first time. I too love the words of wisdom particularly the one about love! I couldn’t find where you comment on the You Tube presentation, just wanted to say my husband and I were in stitches laughing. Thanks for the humour Anna and Karen. Oh, I know wasn’t that an awesome video! Glad you and Walter enjoyed. Note: Fran’s comment and my response refer to a video that was a bit of content that was sent only to subscribers to the Profound Journey site. Loved all the quotes Karen – thank you! I’d forgotten how wonderful Winnie the Pooh books were and you brought it all back. I’m so glad you enjoyed, Anna. I really think that recalling these memories is a great form of self-care. There is a gentle wisdom to Pooh and his friends that has easily stood the test of time. What a great phrase, Joanne – “gentle wisdom” – and so true. I hear you about a couple of the questions on the last quiz. I’m so glad that I’m not a teenager. I couldn’t handle those big decisions! By the way, the quote about comfort zones was for you. I was thinking of your excellent post about the active seniors group you joined.So impressed that you went into the forest. Oh, I only wish I had some honey today (or any day really). I go on jags where I eat peanut butter and honey sandwiches. Things with Winnie the Pooh and I are a little strained. I relate Winnie the Pooh with a certain person that is no longer in my life. She had a huge thing for the bear and anytime I saw one at a yard sale or store I thought of her and if it was cheap enough I would buy it for her. I am starting to lose that now and can fondly recall Winnie the Pooh and what he means to me aside from her. I find it really interesting and once you read the list and what fans think they suffer from it starts to make sense. Weird. My favourite character is the star – Winnie the Pooh himself. All the other characters help to populate the story but Winnie I feel a special kinship with. 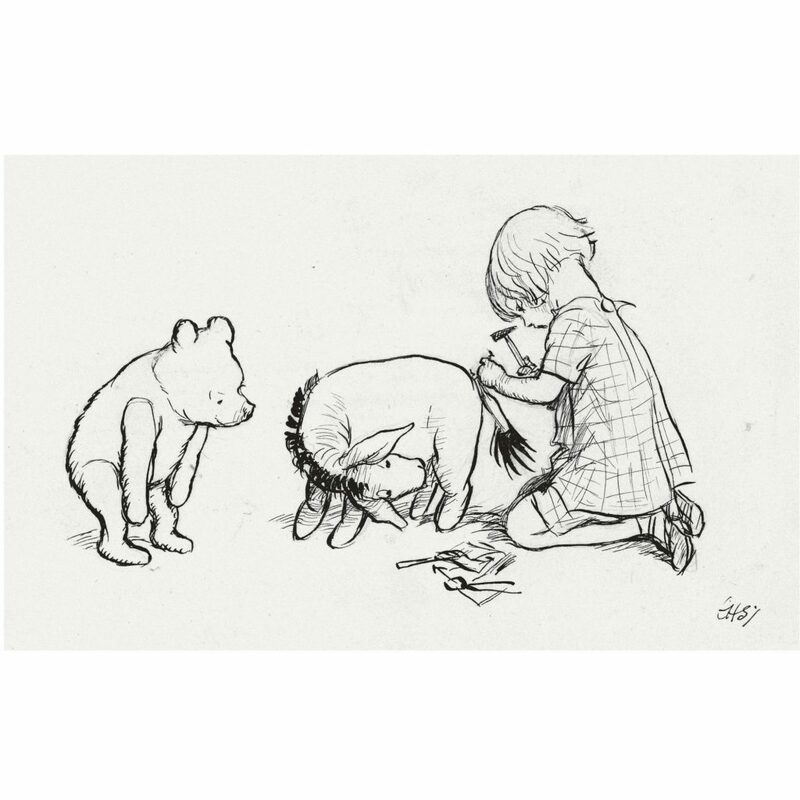 It is not a surprise to me that both A.A. Milne and E.H. Shepard were defined by their involvement with the franchise of Winnie the Pooh. Many an actor gets pigeon-holed when they play a certain part for too long because no one can imagine them playing anything else and they get typecast. As far as Christopher Robin I think he needs to get over himself and move on with his life. He claims his father “had got where he was by climbing on my infant shoulders… and had left me with nothing but the empty fame of being his son.” Writers get their inspiration from all sorts of places…why should Christopher’s dad be any different? I would be thrilled to have a character in a famous story named after me. and the weird one brainfall – I am Winnie again. What a strange quiz that was. Oh, one last comment, my husband and I had a friend named Marty we privately called Eeyore. Talking to him most of the time he sounded just like when Eeyore talks in the books. Thank you, Anna, (and Karen for including it in the email) for the link to the video. I was laughing and horrified all at once. The world is in dire shape since this is the generation that will take the reins next. I did see the mental illness thing when I was researching for this post, but I didn’t include it because, for me, it tarnished the purity of my childhood experience. I’m not surprised someone worked that out. Winnie the Pooh and friends seem to be many things to many people. I think what really did it for Christopher Robin was that his six year old voice had recorded the poems from his father’s two poetry collections. When he was at boarding school, other boys bullied him mercilessly including playing the record over and over and over. Then, when he was finished school and looking for a job, he couldn’t find one because – he claimed – everyone knew of his famous father and thought he wasn’t living up to whatever they considered should be his position in life. Christopher Robin ended up marrying his first cousin and the two of them opened a bookshop. Christopher Robin’s mother had been estranged from her brother (the cousin’s father ) for 30 years, was furious with CR and refused to speak to him for the rest of her life. Hi, I think people see what they want in things like Winnie the Pooh, hence the mental health theory. Sorry to have referred to it and sully your childhood memories after all given that you chose to exclude it for just that reason. Pooh was a big part of my growing up. In fact, we had an Australian Shepard named Pooh (he looked like a bear cub when he was a puppy) when I was young. I didn’t know of any of the background, career limitations, and soiled relationships and I think I will continue to ignore that part of the story. I loved Pooh and all of the characters and they will forever remain living happily in the Hundred Acre Woods (the original woods, not the Disney version). Thank you for sharing the lovely words of wisdom, I had forgotten a few of those. Have you ever read The Tao of Pooh? Oh, and thanks for the video link – too funny! I’m glad that I no longer need to hire people. I have indeed read the Tao of Pooh. In fact, I think I own it. I hadn’t fessed up to that because the Pooh dictionary (and the stuffed Eeyore and Tigger toys that I copped to in an earlier comment) already seemed a bit over the top as purchases made as an adult and for myself. Ditto on the happy NOT to be in the environment described in the video! What an interesting post Karen! I learned so much about the behind the scenes of Winnie the Pooh. Sad that the writer and the illustrator became “typecast” as it were, by the success of the characters and that this bothered them greatly. This seems to happen a lot. Leonard Nimoy came out with the “I am not Spock” book but then later made peace with it and even embraced the fact that he would be forever aligned with that character. I’d like to think that I would be able accept something like this with good grace if it ever happened to me. (Hah, not likely to ever become a worry of mine). Thanks for sharing! 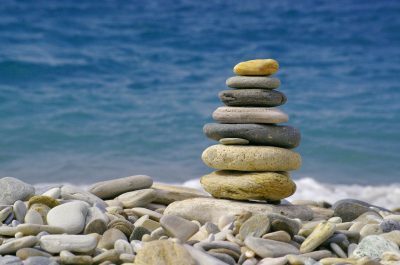 Hi, Karen – Great post! 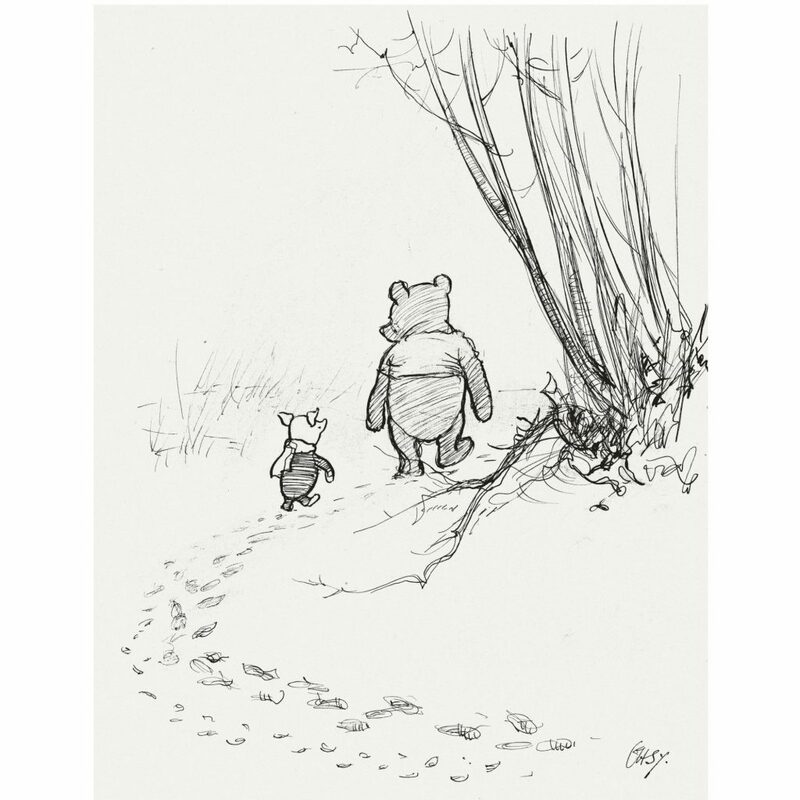 Pooh was one of my favourites when I was growing up…and a favourite for my son, Creighton. Great memories! Thank you for sharing these quotes. Thanks, Donna. By the way, I love the name Creighton! Unfortunately, I didn’t grow up with Winnie the Pooh, but we have many other favorite cartoon characters. Belgium produced some really good cartoon creators and characters, some of which became world famous, like Tintin. I wondered if you were familiar with Winnie the Pooh when I read that the books had been translated into 50 languages. But I can certainly see that Tintin would be front and center. I hadn’t realized he originated in Belgium. Mmm, a brownie.So much better than honey in my books! Winnie the Pooh was part of my childhood, and, of course, I also read Pooh stories to my children. I remember that as a small child, I was quite disturbed by the Eeyore character, and want to skip all the stories that had him in it! I too remember being disturbed by Eeyore. I don’t remember if I was afraid of him for some reason or if I just felt unbearably sad, but, now that you mention it, I do remember the feeling.